You can expect a newsletter announcing this to go out later this week. Cheers! This month we’ve had two holidays where I took pictures, and I didn’t post them until now; sorry for making you wait. First, Leive and I had our 24th anniversary on Sunday, November 15. We celebrated it at our pastor’s house, because they host a prayer group for whole families on Sunday nights. Leive had the urge to cook, so she did most of the cooking of a Thanksgiving-style dinner again, though she was one of the guests of honor. The main thing that Leive didn’t make was this chocolate cake. In normal light the orange icing looked more red, but no matter! Here we are cutting it. 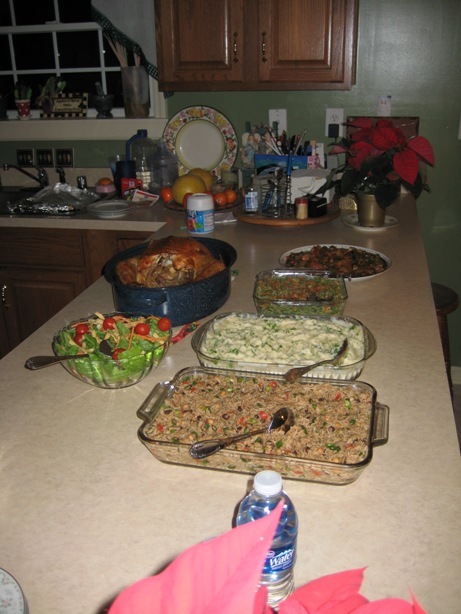 The dishes we brought were a turkey, Leive’s special mashed potato recipe, yellow rice, a green bean casserole and a garden salad. 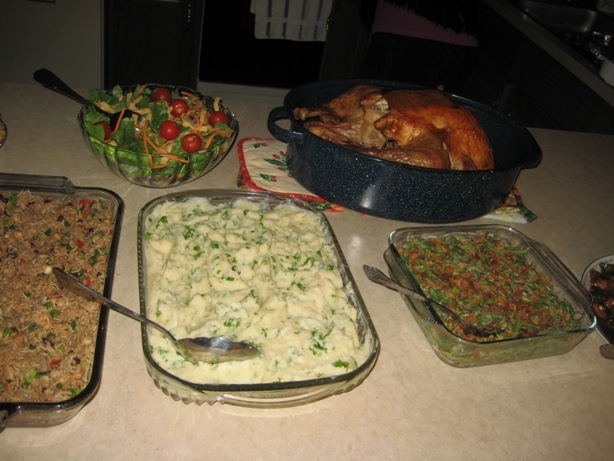 Above you can see most of the side dishes. Rezia was there, too. In front of her you can see the salad, cranberry sauce and gravy. 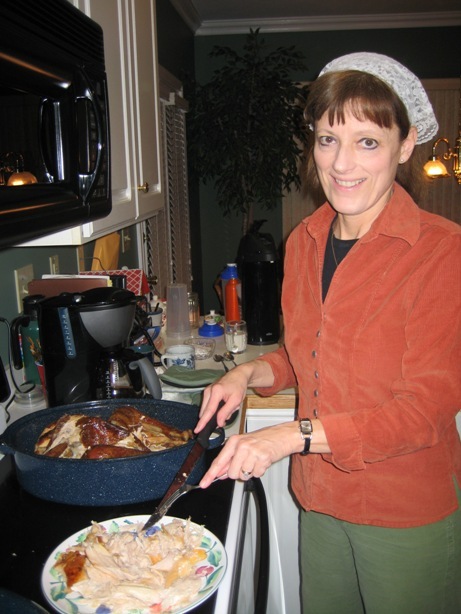 Sally, the pastor’s wife, helped carve the turkey. 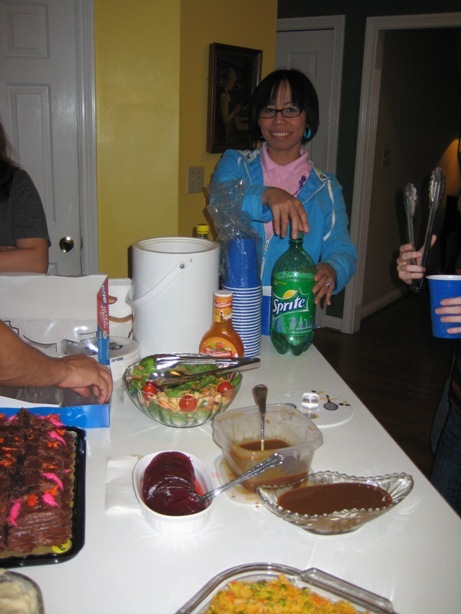 And now here are the Thanksgiving pictures. Thursday was a slow day for us; instead of the traditional feast, we ate lightly (I mainly had a salad). We did that because Gene and Rezia were out of town, visiting Gene’s relatives in western Kentucky. Without them it would only be the two of us (three, if you count the parrot). On Friday they came back, so Leive prepared the food and we invited them over. 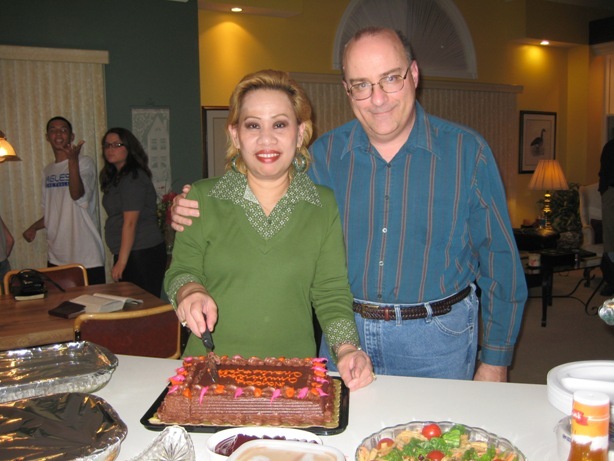 We also invited a friend from church, Sherrie Masters, because she invited us to her birthday party the previous Sunday. Here Leive stands behind her creations. This is the side view. On the left, a garden salad and the turkey. On the right, from front to back: a bottle of water from Kroger, fried rice, mashed potatoes, green bean casserole, halang-halang. The poinsettias in the extreme front and rear were decorations I found on special while shopping–marked down from $5.99 to 99 cents! A closeup of the halang-halang and the rear poinsettia. Because it was so good for Rezia the last time she made it, Leive added extra jalapenos to make it very halang! 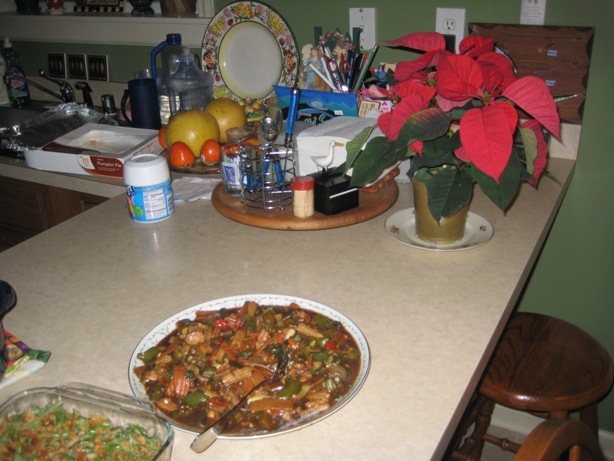 The persimmons and pumelos (bo’ongon) by the sink were not part of the meal. 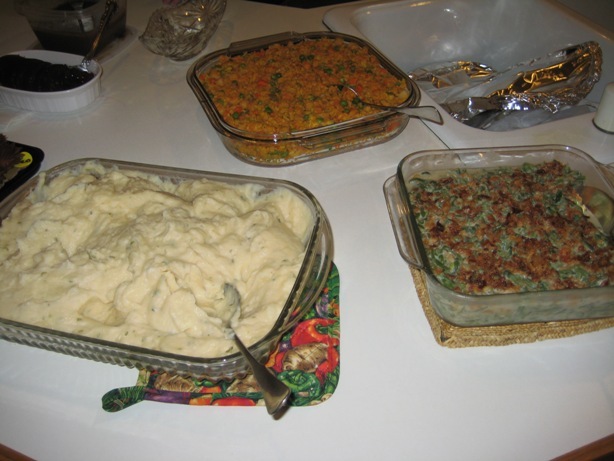 Another view of the mashed potatoes, green bean casserole, salad and turkey. 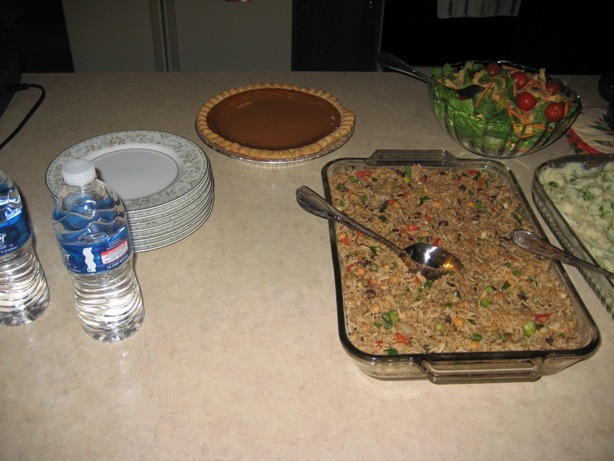 The water and the rice again, and don’t forget the pumpkin pie! Our guests, from left to right: Sherrie, Gene, and Rezia. After the meal, Leive gave them some plates of food to take home. I was impressed at how fast Sherrie’s mother called back to thank us. 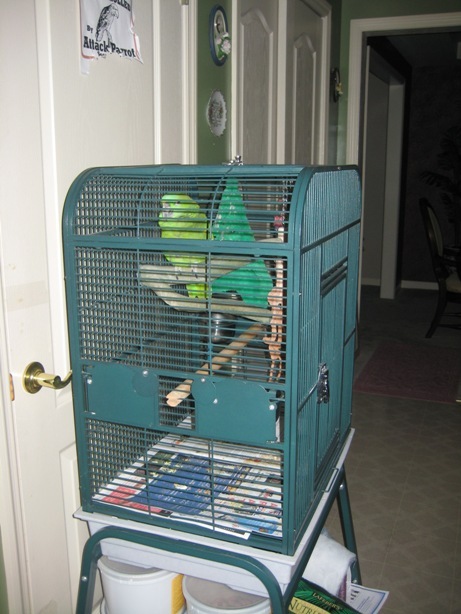 Our parrot, Brin-Brin, was surprisingly quiet. Throughout the whole meal he didn’t move or make a sound. He has acted normally since then, though, so I know that wasn’t a fake or stuffed parrot in the cage. Normally he snaps when Gene is here, and cries when Rezia is here. Maybe Leive and Sherrie were calming influences, because both of them are all right in his book. Or maybe he’s thankful again that he wasn’t one of the courses served! Hope your Thanksgiving was a happy one, too. All your favorites make their appearances here: Gonzo and his chickens, Ralph the piano-playing dog, Fozzie Bear, Animal, Dr. Bunsen Honeyburner, the Swedish Chef, Miss Piggy, Animal, Dr. Teeth, Sam the Eagle, and even the guy who throws the boomerang fish. And just when you think Kermit and Scooter aren’t there, they deliver the punch line. 1. Could somebody post a page or video on what the lyrics mean? “Bohemian Rhapsody” probably has the strangest lyrics of any popular song from my generation. I’m figuring it succeeded because Queen is such a big-name band; anything they sing is bound to get attention. Last year I saw a YouTube video that explained each line from another popular but puzzling song, “American Pie.” It turns out all the words there are either references to the death of Buddy Holly, or talking about other stuff happening at that time. 2. On March 14, 2008, I posted a video from Gregorian, a band that does Gregorian chant versions of modern songs. Since then I have discovered and downloaded Songs of Queen, an album where they got medieval on twelve Queen hits. “Bohemian Rhapsody” wasn’t one of them; do you think they might do it in the future? All I have left to do is post a commentary on where we are going as a nation in 2009, and then the chapter will be done! Expect to see that on Saturday or Sunday. 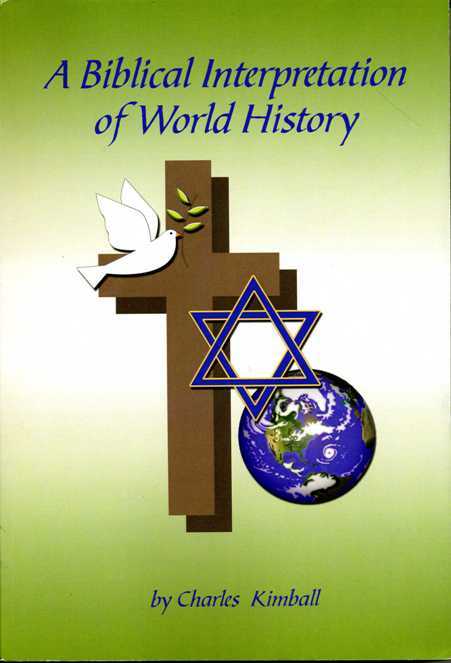 See Chapter 4, footnote #96 of my North American history series, if you don’t understand the title. Anyway, yesterday the president of Iran, Mahmoud Ahmadinejad, visited Venezuela to meet with Hugo Chavez, another enemy of the United States. At the Caracas airport they greeted him with ceremonial guards and the Iranian national anthem, as you might expect, but it was the wrong Iranian national anthem. What they played was “Sorood-e Shahanshahi Iran,” which means “Imperial Salute of Iran” — the Shah’s national anthem! This became the official anthem in 1933 and was replaced after the last Shah, Mohammed Reza Pahlavi, was ousted in the 1979 Iranian Revolution. You know any Iranian leader who has been in charge over the past thirty years isn’t going to like that. “Sorood e Shahanshahi” for Ahmadinejad, Oh my god! In the video Ahmadinejad played it cool, acting like there was nothing wrong, but you know the anthem must have given him the creeps. Middle Easterners are a superstitious bunch, and Ahmadinejad is not a rational man. He may have seen this as an omen of the old monarchy coming back. I was immediately reminded of an incident like this happening to another Iranian anti-Semite. That would be the scene in Esther 6:13, where Haman takes Mordechai around the city on the king’s horse, and his wife tells him this is a sign that his plot against the Jews won’t succeed. Has anybody told Reza Pahlavi, the late Shah’s son, about this? He proclaimed himself Shah a few months after his father’s death, but so far hasn’t had a realistic chance of getting the Peacock Throne for himself. This story will make his day for sure! This also ought a teach a lesson to the ayatollahs; this is what they get for driving all of Iran’s musicians out of the country, because they think Islam is incompatible with music. As a world music fan, I have some Iranian songs in my collection, but all of them were either recorded before 1979, or come from artists who don’t live in Iran anymore. The amazing Azam Ali, for instance, fled Iran with her family in 1979, when she was four years old. Here she sings one of her more recent songs, “The Hunt,” at a concert which I believe took place in 2007. 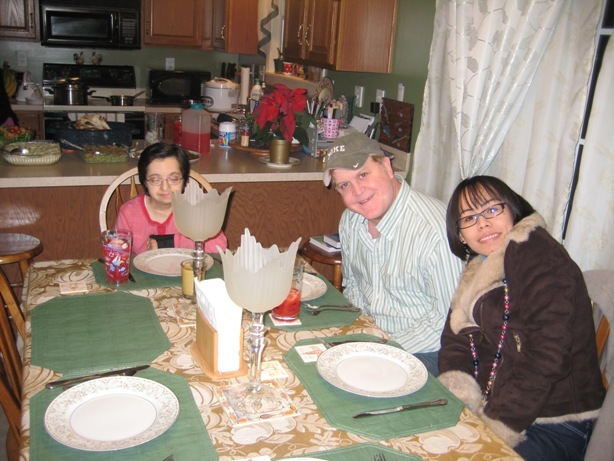 This year we’ll wait until tomorrow for the big meal, because we want to have it with Gene and Rezia, and they are out of town today, visiting Gene’s family in western Kentucky. 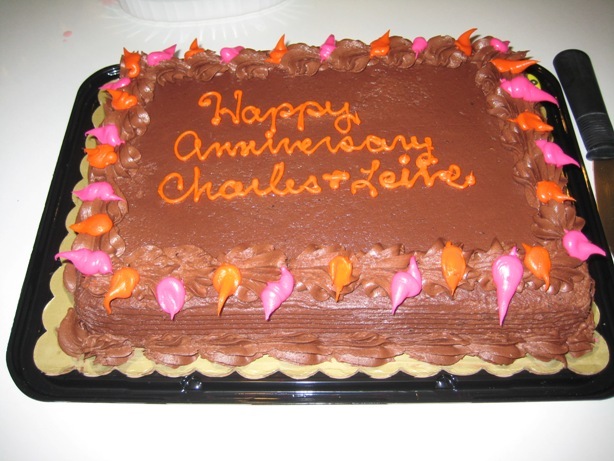 In the meantime, maybe I can finally resize and post the pictures from last week’s anniversary celebration. And here is a list my pastor shared with us at his most recent sermon, giving us reasons to be thankful for things we normally aren’t thankful about. For the teenager who is not doing dishes but is watching TV, because that means he is at home and not on the streets. For the taxes I pay, because it means that I am employed. For the mess to clean after a party, because it means that I have been surrounded by friends. For the clothes that fit a little too snug, because it means I have enough to eat. For my shadow that watches me work, because it means I am out in the sunshine. For a lawn that needs mowing, windows that need cleaning, and gutters that need fixing, because it means I have a home. For all the complaining I hear about the government, because it means that we have freedom of speech. For the parking spot I find at the far end of the parking lot, because it means I am capable of walking, and that I have been blessed with transportation. For my huge heating bill, because it means I am warm. For the lady behind me in my place of worship when she sings off key, because it means that I can hear. For the pile of laundry and ironing, because it means I have clothes to wear. For weariness and aching muscles at the end of the day, because it means I am capable of working hard. For the alarm that goes off in the early morning hours, because it means that I am alive. For too much e-mail, because it means I have friends who are thinking of me. Happy Thanksgiving! And see my message from last April 9 on when and where the first Thanksgiving really happened. As with the others, read and enjoy!